Paul Tiessen was born in 1944. He is Professor Emeritus in the Department of English and Film Studies at Wilfrid Laurier University, located in Waterloo, Ontario, Canada. He has published widely in the fields of modernism, cultural theory, and film theory. Tiessen retains special interest in the works of Malcolm Lowry: he was editor of the Malcolm Lowry Newsletter (1977-1984); founding editor of The Malcolm Lowry Review (1984 to 2002); and editor and co-editor of works by Lowry and scholarly volumes about Lowry. Significant critical volumes on Lowry that Tiessen has edited or co-edited include The Letters of Malcolm Lowry and Gerald Noxon, 1940-1952 (1988), Apparently Incongruous Parts: The Worlds of Malcolm Lowry (1990), The Cinema of Malcolm Lowry: A Scholarly Edition of Lowry’s ‘Tender is the Night’ (1990), Joyce/Lowry: Critical Perspectives (1997), and A Darkness that Murmured: Essays on Malcolm Lowry and the Twentieth Century (2000). In collaboration with five other academics and the Editing Modernism in Canada (EMiC) project, Tiessen has created a series of new scholarly editions of Lowry’s works, including Swinging the Maelstrom (2013), In Ballast to the White Sea (2014), and The 1940 Under the Volcano (2015). Additionally, Tiessen wrote the introduction to Notes on a Screenplay for F. Scott Fitzgerald’s ‘Tender is the Night’ by Malcolm Lowry and Margerie Bonner Lowry (1976). The collection consists of letters created or received by Paul Tiessen regarding the movie-going practices and environments of Malcolm Lowry. Letters were created from 1968-1988 and address five main topics of Tiessen’s queries: Lowry’s early years (1909-1927); visit to Bonn, Germany (1928); education at the University of Cambridge (1929-1932); time in the United States, particularly Hollywood; and settlement and activities in Vancouver, especially in relation to the local Film Society movement. Significant correspondents represented in the collection include the following: Russell Lowry, brother of Malcolm Lowry; Margerie Lowry, Malcolm Lowry’s widow; Muriel Bradbrook, Cambridge professor and author of a Lowry biography; Rachael Low, film historian; Gerald Noxon, Lowry’s Canadian friend; Christopher Isherwood, author and Hollywood reader of one of Lowry’s film scripts; and Earl and Esther Birney, Lowry’s friends and attendees of Vancouver Film Society screenings. Letters in the collection are arranged in subject files dedicated to particular correspondents (e.g. Russell Lowry) or areas of Tiessen’s inquiry (e.g. Lowry’s time in Germany). Letters in files are arranged chronologically. Documentary forms in the collection include correspondence (handwritten and typed), copies of the Malcolm Lowry Newsletter, newspaper clippings, a pamphlet from the British Film Institute, photocopies of various journal articles, and library photoduplication order forms. Records are in good condition. Records were donated by Paul Tiessen in May 2017. 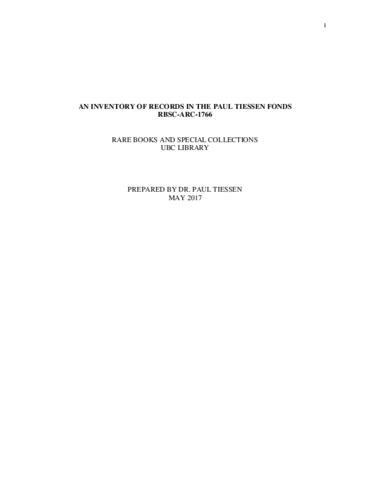 The archivist maintained Tiessen’s physical and intellectual order in the arrangement and description of this collection. No access restrictions have been applied. A PDF inventory compiled by Paul Tiessen has been attached. This inventory contains descriptions of individual items in the collection and some notes on letters included in Tiessen’s Malcolm Lowry Review archive. As of 2017, Tiessen retains possession of an additional archive dedicated to the journal Malcolm Lowry Review. Some records in the collection are protected under copyright. Permission to reproduce copyrighted materials must be obtained from the copyright holder(s). See archivist for details. Created by Gillian Dunks in June 2017.